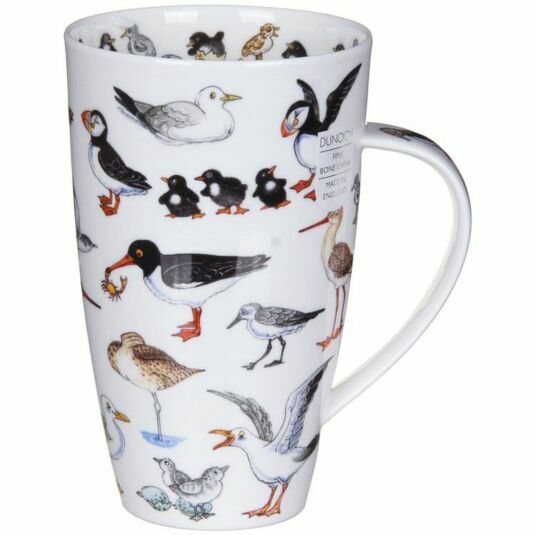 Intimate portraits of coastal birds are gathered together on this mug from Dunoon by artist Cherry Denman. Lovingly portrayed in humorous style, the images include Waders, Gulls and Puffins, sometimes with their chicks, sometimes roosting, occasionally hatching but all in great detail. Further images adorn the interior of the mug. A great gift for wildlife lovers, and a piece to treasure. A mug for the very thirsty, Henley shape mugs have a capacity of 600ml- that's more than a pint! Mmm... a pint of tea... just imagine! With decorated handle, all designs are both dishwasher and microwave safe, with the exception of those featuring gold embellishment.